On-Time, With Personal Service, At An Affordable Price. Thanks For Visiting Our DVD Store! Having a problem ordering? Not comfortable ordering on-line? Feel free to contact us for alternatives! The detailed route descriptions of The Keyhole, The Loft, The North Face, and Kieners coupled with compelling stills and video give the viewer a superior sense of what it's like to be on Colorado's favorite 14er - Longs Peak. Even those who have already experienced Longs Peak first hand will now be able to appreciate and enjoy aerial views and video of the peak in all seasons. Narrated by world-class climber and author Gerry Roach. 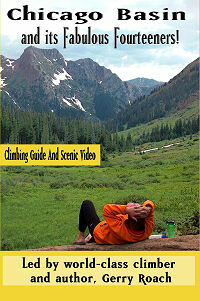 With detailed route descriptions for the famous Colorado fourteeners Sunlight, Windom, and Eolus coupled with stunning scenic, narrow gauge train, and wildlife video, this is a must have DVD for any mountain lover! 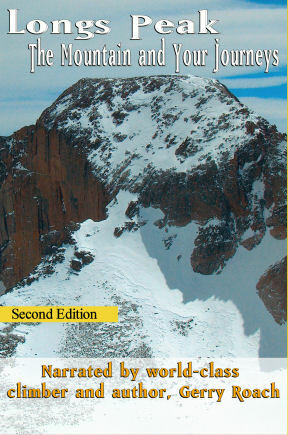 This DVD makes a superb resource for anyone who is thinking about, or already has, visited that special place in Colorado's San Juan mountains known as Chicago Basin. Narrated by world-class climber and author Gerry Roach. Click here to see more detail on this product. Save by buying both DVDs: Longs Peak - The Mountain and Your Journeys (2nd Edition) and Chicago Basin and its Fabulous Fourteeners! No incremental shipping cost over purchasing just one of these great titles.